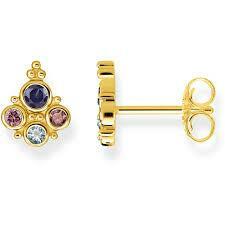 From Thomas Sabo are these stunning Gold Coloured Stone Studs. A perfect addition to any outfit, especially for an occasion, with the sparkling stones. The Thomas Sabo Gold Coloured Stone Studs feature four small coloured Cubic Zirconia stones in a cluster. With the sparkling design, these studs would be a perfect addition to an outfit during the warmer months. These stud earrings would be the perfect gift for her.